When an entire city learns that a hurricane is heading for them, what to do they do? What are their options? What happens after? These are all questions asked and answered in 2005 when Hurricane Katrina hit the Gulf Coast of America. Seeing the results of the storm, Josh Neufeld signed up to be a Red Cross volunteer and served as a disaster response worker in Biloxi, Mississippi for almost a month. In the interest of being a journalist and an artist, he began to blog and draw about his experiences as America watched the disaster and the response unfold. 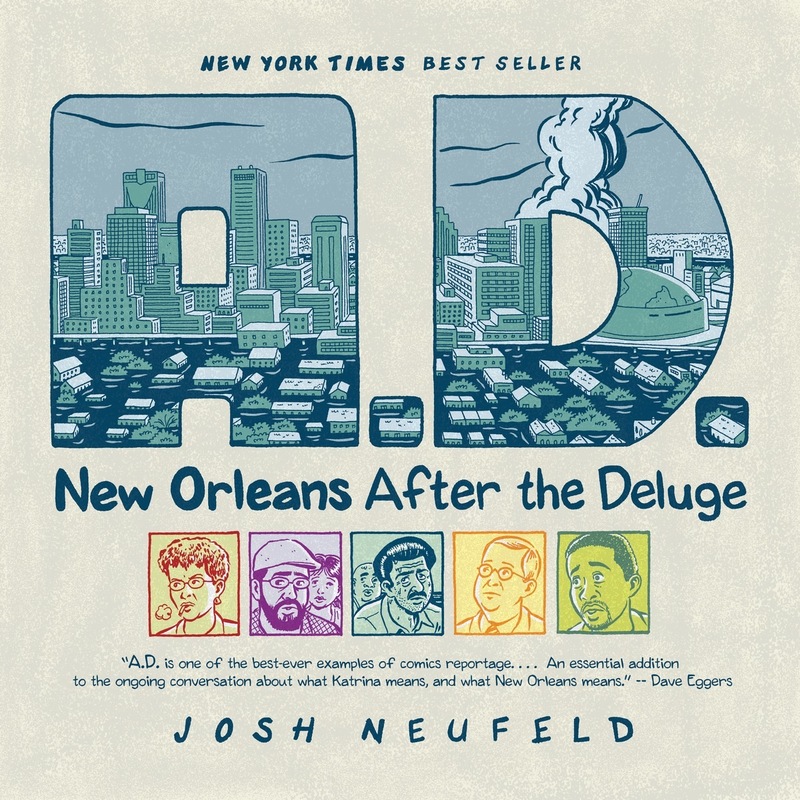 A.D.: New Orleans After the Deluge by Josh Neufeld is a graphic novel that tells the stories of a handful of real-life New Orleans residents and their experiences during the time of Hurricane Katrina. This is the first graphic novel to ever be introduced by OKCU Reads and we hope you take the time to not only read, but also see the experiences of these characters in this new form of journalism and reporting..
Josh Neufeld is a cartoonist who primarily works in the field of nonfiction comics, specifically as comics journalist. He has lived all over the world, but currently lives in Brooklyn, New York, with his wife, Sari, who is also a novelist, and daughter, Phoebe. Neufeld’s work has drawn him much acclaim, he is a New York Times bestselling author and he is an Atlantic Center for the Arts Master Artist. He has been the recipient of the Knight-Wallace Fellowship in Journalism and Xeric Award. He has been nominated for the Eisner Award, Harvey Award and Ignatz Award. He has worked for the U.S. State Department to present his work and represent American culture abroad. 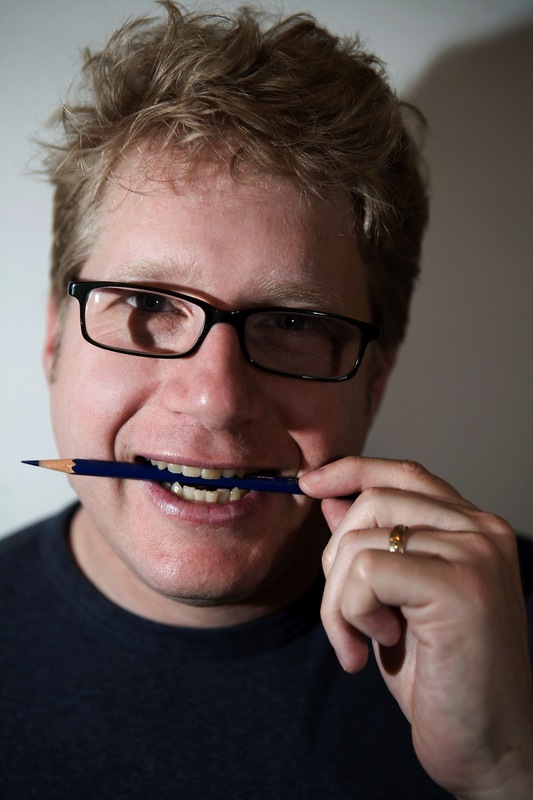 Neufeld has been drawing “seriously” since he was four years old. In a family that was constantly moving, he used drawing as a way of entertaining himself. He still keeps the comics he drew as a small child. As he grew older he became more interested in exploring “unconventional” subjects for his genre and nonfiction work. He wanted to explore journalism through the medium of graphic novels. OKCU Reads is new students’ first opportunity to engage with the community of scholars that is central to the OKCU experience. In August, as part of Stars Week: New Student Orientation, first-year students will participate in a series of discussions and activities providing a deeper appreciation of A.D.: New Orleans After the Deluge. Creative Reflections on A.D.: New Orleans After the Deluge. CLASS, COMMUNITY andMEDIA describe key elements of Neufeld’s work. LETTERS entries: Must be submitted by email as a Word attachment, by mail, or in person. ARTS entries: Performance Arts must be submitted on DVD. Visual Arts entries must be submitted in a form ready to exhibit, i.e. mounted for display, fully assembled, etc. All entries may either be posted on the OCUReads web page and/or displayed during the author’s visit. Each winner will also be invited to attend dinner with the author, Josh Neufeld, Thursday, August 20th.